Pink Looks from our Followers! Today marks the last day of Breast Cancer Awareness Month! Our blog has been all about the pink this month – from the new pink jewelry we featured in our online collections to all of the pink press we’ve received for our pink jewelry sales funding cancer organizations such as Stand Up to Cancer all month long. For today’s post, we wanted to show how our fans have gone pink to support breast cancer awareness! 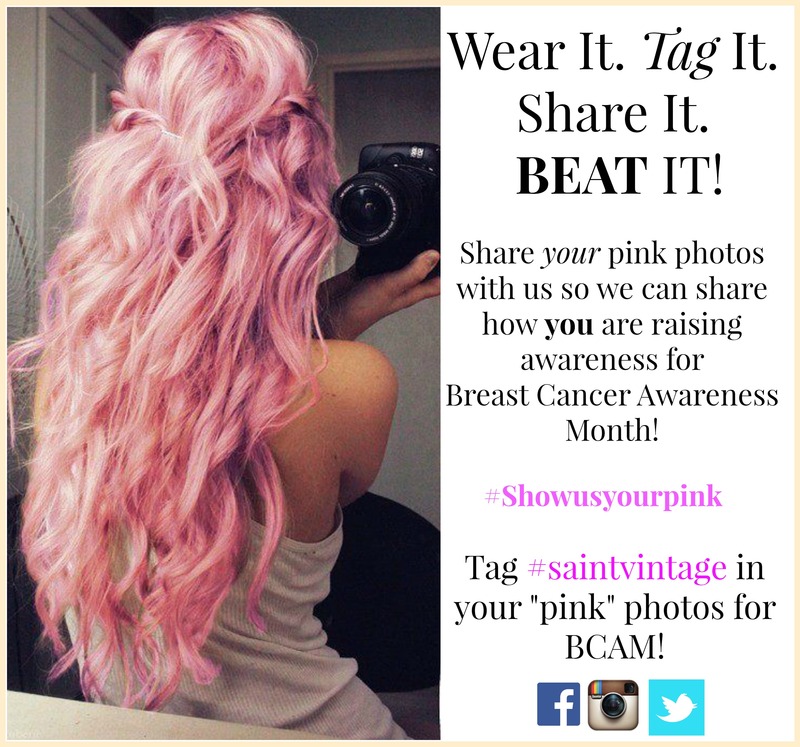 We have been asking our followers to Wear it, Tag it, Share it, and Beat it by documenting how they are rocking their pink looks this October and tagging Saint Vintage in their pictures. Blogger Lanie of Laniebird Designs (a nickname coined by her twin sister) donned her pink vintage dress coat in honor of Breast Cancer Awareness Month! 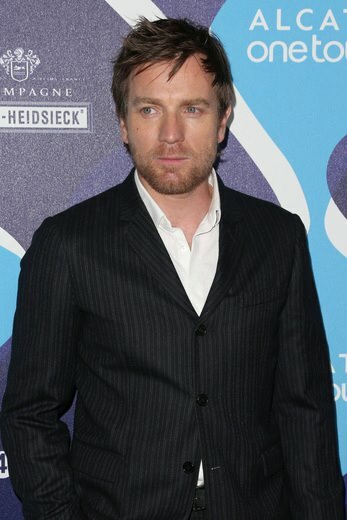 We loved this look! She even wrote a blog post about her inspiration and titled it “Pretty in Pink.” You can read more from her blog here! Ray Miles Jr., one of our Facebook fans, sent us a picture immediately after dying his hair pink! The pink mohawk really mixes well and creates an attention-grabbing look. Krystal Faircloth, another fashion blogger, showed us this chic pink dress that she wore for the first day of Breast Cancer Awareness Month! 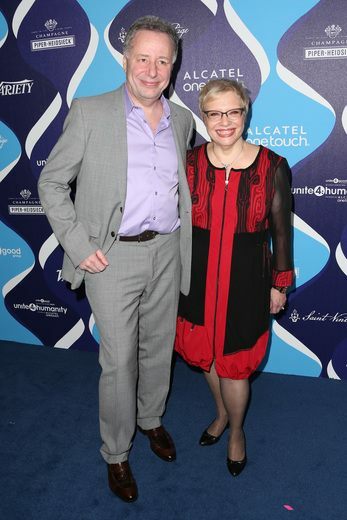 (And we loved the polkadot heels she wore with it!) You can see the whole post here. Instagram follower @timeforcouture not only tagged us in her pink picture – but she wore our pink Couture ring in support! Not only did she raise awareness for breast cancer, but her pink purchase donated 50% to Stand Up to Cancer to fight for the cure! Today is the LAST DAY that our pink jewelry sales will donate 50% to cancer research, so, if you were inspired by these pink looks, we hope that you will shop our collections for your own pink! Although Breast Cancer Awareness Month is over, we can’t stop fighting for the pink warriors affected by cancer – every day should be a fight to cure this terrible disease! Check out even more pink looks on our Twitter and Instagram feed! 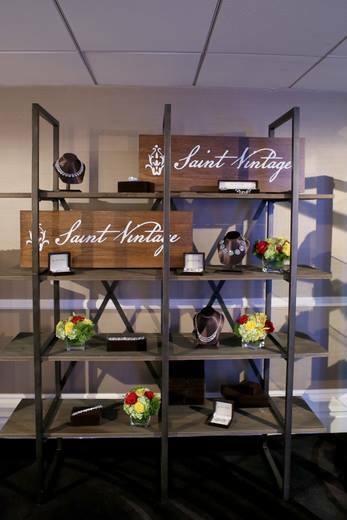 October has continued to be a big month for Saint Vintage! We are so thankful for all of your love and support, but we are even more excited about what your support has done for all the warriors of breast cancer! For Breast Cancer Awareness Month, we have been running a special campaign that donates 50% of all pink jewelry sales to the Stand Up to Cancer foundation all month long. There is only one more week left, so we want to fight to give back and raise awareness for breast cancer even harder this week! A few weeks ago, The Fabulous Report (a New York City guide for all things fabulous), featured us in an online report! Their article was showing their followers where you can shop AND give back to support a good cause. Our pink jewelry not only makes you look fabulous, but you will feel fabulous because you are funding a great organization fighting to cure cancer. Read the entire article, titled “Support BCA Month with Saint Vintage,” here! Last Thursday, Sadie Murray hosted a segment on KCRA 3 called “Help Breast Cancer Awareness While You Shop.” Two pieces from our new pink jewelry collection were featured – our Blake Love Strand and our Couture Cluster Stud Earrings! 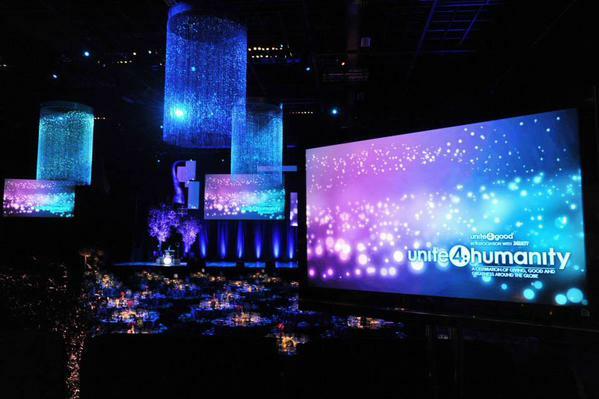 We were honored to be mentioned for all that our brand does to support others! Watch the entire segment here! Saint Vintage has always been committed to fighting alongside people battling cancer! This comes from SV founder Paige Jansen-Nichols’ survival story after battling cancer 3 times. We all have a reason to wear pink. Whether it’s because you know someone currently battling cancer, or you are currently fighting your own battle, or you want to celebrate your story of survival – shop for the cause now! There is only one week left to fight for the cure with pink! Join us in standing alongside breast cancer warriors by shopping our collections. Follow us on Twitter, Instagram, and Facebook to see all of our pink looks! Pink for Breast Cancer Awareness! October may mark the onset of the fall season, but it is also home to Breast Cancer Awareness Month. As the second most common cancer affecting women – 1 in every 8 women will be diagnosed with breast cancer in her lifetime – there is a great demand to raise awareness for breast cancer’s signs and symptoms. With early detection it is possible to survive breast cancer, which is why doctors push for women between the ages of 40-49 to begin scheduling their mammogram appointments. Even more importantly, women between the ages of 50-74 should continue prevention by getting mammograms at least once a year. Breast cancer awareness is the reason why you see pink everywhere throughout October. In February, pink is the color of love and romance. However, in October, pink takes on a tougher persona. It becomes the color of the physical and mental strength these warriors battling breast cancer wield. To honor Breast Cancer Awareness Month, and those whose lives it has affected, Saint Vintage is going pink in October by donating 50% of ALL pink jewelry sales to Stand Up to Cancer all month long! We have just uploaded some new pink jewelry onto our online store so that you can begin shopping for a cause! We also want YOU to show us your pink this month! We want to share how you are raising awareness for breast cancer. Join in the fight by tagging @saintvintage in your pink photos on Facebook, or using #saintvintage to show off your pink on Instagram and Twitter! Also, to show you our appreciation for your support, we are also offering FREE shipping on ANY jewelry purchase all month! Just use code “SV4BCA” at checkout to get this special offer from Saint Vintage! Find your pink with us and your jewelry purchase will help fund cancer research AND make your outfit come alive! What girl doesn’t love to wear pink every now and then… or all the time? The color pink is commonly associated with very feminine qualities, which is often why we choose pink when we want to feel pretty. The color pink also represents other characteristics when used under specific circumstances. For example, Valentine’s Day has made pink the color of love and romance, while pink symbolizes strength and perseverance when used to promote breast cancer awareness in October! Featured below are a few pink pieces from our collections. So whatever your reasons are for wearing pink, get the piece that expresses your story here at Saint Vintage! This bracelet is a part of our Love Cures collection! The focal point of this bracelet is the striking pink crystal flower that is surrounded by vintage pink beads. It is a stretchy fit, which makes it more comfortable for you! Perhaps the most amazing characteristic of this Love Cures bracelet is that it is a part of our Wear a Bracelet, Find a Cure campaign, which donates 50% of profits to the Stand Up to Cancer foundation to help fund cancer research! Get yours and give back! 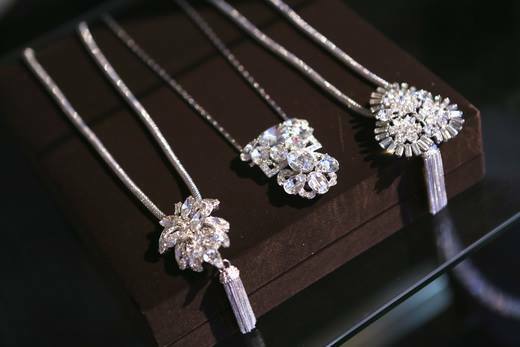 From our Saint Vintage collection is this sparkling Lana necklace that is composed of pink crystal flowers. This necklace is ideal for any outfit and any occasion! Wear it with a blouse and jeans or dress it up with your favorite Friday night look! 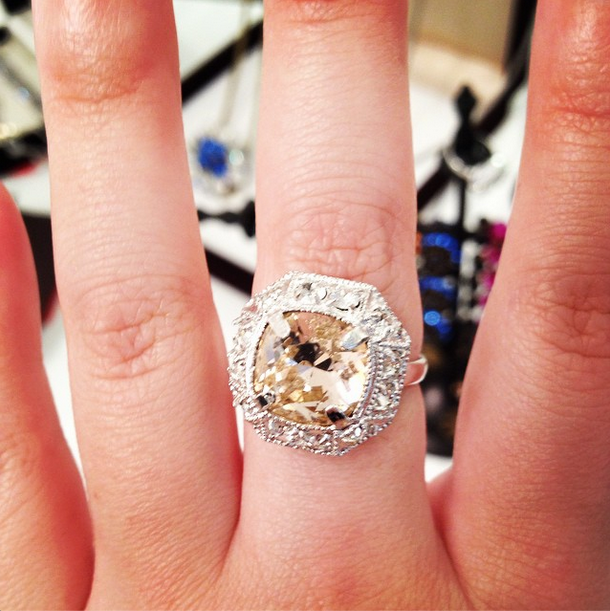 One thing is certain – you will get a lot of attention with this piece! If you prefer earrings over a bracelet or necklace, these Pink Heart earrings from our Love Drops collection may be what you are looking for! Subtle yet beautiful, these earrings were handmade with expert hands in Atlanta just for you. Heart-shaped and embellished with small pink crystals, you will find that they are incredibly easy to style! Get your pink either online or look at our store locator to find a store near you that sells Saint Vintage jewelry! Follow us on Twitter, Pinterest, or Instagram to be a part of the cause and together we will find the cure for cancer! Spread Awareness to Find a Cure! Last week we celebrated National Women’s Health Week, May 11th to 17th! During that week we also celebrated National Women’s Check-up Day on May 13th. May is home to many cancer related celebrations such as Skin Cancer Detection and Prevention Month, Cancer Research Month and Brain Tumor Awareness Month. How can you help in the fight against cancer? It could be as simple as wearing the bracelet below. With every Love Cures bracelet sold we donate 50% of sales to Stand Up to Cancer & cancer research. Shop our collections at Saintvintage.com and stay connected with us on Facebook, Twitter, and Pinterest.